EEEP! Finally getting this bad-boy all set up. Most information as been happening over at my Facebook page, sorry I have been crazy busy with other stuff. I know, I know that is so bad. But COVER REVEAL ON FRIDAY figured it was time! Haha sorry about that. So I guess introductions are in order. 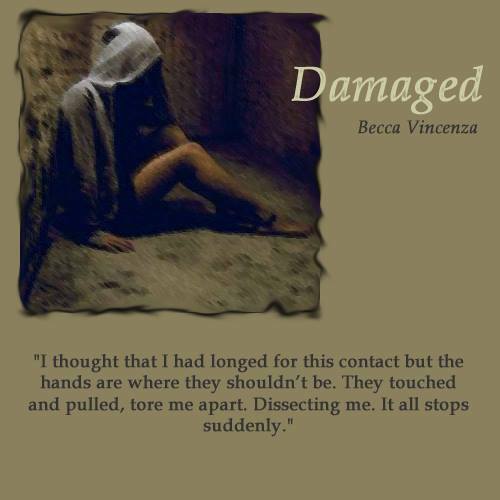 HI, I am Becca – (hopefully) soon to be published indie author, my first book is called Damaged part of a series called The Rebirth Series, now I don’t want to give away too much about the first yet, but you can check out the synopsis for book one under the Rebirth Series tab. Anyways, I almost gave up on the idea of writing. Crazy I know. But yeah it was a huge decision for me to really get back into this. Writing has always been a love of mine, sort of… it really started in the end of the 5th grade, and beginning of 6th grade. Anyways right now where I am at in Damaged is, it’s done, its written, its being edited. I am hoping December but there might be a chance it will be pushed back to January but I promise I will keep peoples updated.